Award Announcement EPA Regional Administrator Shawn M. Garvin addresses audience members during the announcement of a major EPA grant to the Virginia Institute of Marine Science. Photo by David Malmquist. Principals From L: Dr. John Wells, VIMS Dean & Director; Dr. Roger Mann, Director of Advisory Services at VIMS; Ms. Marcia Berman, Manager of VIMS’ Comprehensive Coastal Inventory; Dr. Kirk Havens, Assistant Director of the Center for Coastal Resources Management at VIMS; Dr. Donna Bilkovic, a research assistant professor in VIMS’ Coastal Watershed program; and EPA Regional Administrator Shawn M. Garvin. Photo by David Malmquist. Dr. John Wells VIMS Dean and Director John Wells addresses audience members during the announcement of a major EPA grant to the Virginia Institute of Marine Science. Photo by David Malmquist. Dr. Kirk Havens VIMS researcher Dr. Kirk Havens addresses audience members during the announcement of a major EPA grant to the Virginia Institute of Marine Science. Photo by David Malmquist. 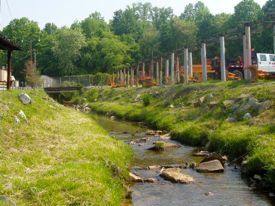 Every day throughout Chesapeake Bay’s 64,000-square-mile watershed, city and county officials make land-use decisions—approval of a new subdivision, siting of a retention pond, preservation of a green space—that ultimately impact the Bay through their effects on the headwater wetlands that provide a first-line of defense for Bay water quality. Now, a 3-year, $999,640 grant from the U.S. Environmental Protection Agency to the Virginia Institute of Marine Science will allow VIMS researchers to develop planning tools that will help local governments and citizens more effectively and efficiently protect the upland swamps and swales that keep pollutants and excess nutrients from entering Bay tributaries. The project will expand on VIMS’ previous contributions to Virginia’s EPA-approved Wetland Program Plan, and supports the broader U.S. policy of “no net loss” of wetlands, first implemented by President George H.W. Bush in 1988. Ultimately, protection and regulation of the nation’s wetlands is mandated under the Clean Water Act of 1972. Hershner will collaborate on the project with Dr. Kirk Havens, Assistant Director of the Center for Coastal Resources Management; Ms. Marcia Berman, manager of VIMS’ Comprehensive Coastal Inventory; and Dr. Donna Bilkovic, a research assistant professor in VIMS’ Coastal Watershed program. Previous research shows that headwater wetlands—by intercepting and modifying runoff and groundwater before it can enter the Bay’s tributary streams—are particularly important for protecting Bay water quality, and that protecting them will benefit water quality proportionately more than preservation of wetlands further downstream. Hershner’s team will use the EPA grant to address three key elements of Virginia’s current wetlands plan. Their work will build off similar tools they’ve created for managing tidal wetlands, and leverage a treasure trove of geographic data they’ve collected and interpreted during the last two decades. Results from one of the team’s previous mapping projects— a 2003 collaboration between VIMS and the U.S. Fish and Wildlife Service’s National Wetlands Inventory Program—indicate the scope of their planned undertaking. 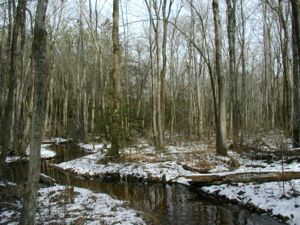 The 2003 effort tallied approximately 515,536 acres of headwater wetlands in Virginia, about 43% of all vegetated wetlands in the Commonwealth. These streamside wetlands filter the water entering all of Chesapeake Bay's tributaries and feeder streams in Virginia, including the Appomattox, James, York, Rappahannock, and Potomac rivers.